Walking west up The Royal Mile toward the castle we investigated some closes. A close is an alley. The Old Town is riddled with them. They were the main access during the 16th and 17th centuries to the tenement buildings, some reaching twelve stories, that were the primary residences and commercial properties in the city during that time. 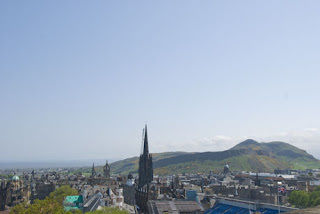 We walked past John Knox's House, the Mercat Cross, St. Giles Cathedral, Lady Stair's Close and Gladstone's Land on the way up to the castle. The former home of the unfortunate Lady Stair. 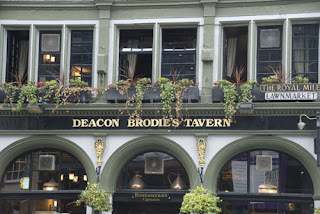 This tavern takes its name from Deacon Brodie, whose life served as inspiration for Robert Louis Stevenson's The Strange Case of Dr. Jekyll and Mr. Hyde. 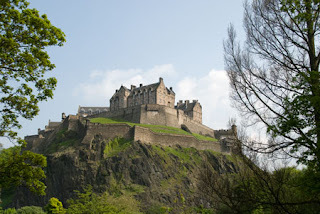 Edinburgh Castle is a large sprawling structure, much torn down and rebuilt. It resembles more a fortified estate, or small town, than what one usually thinks of as a castle. 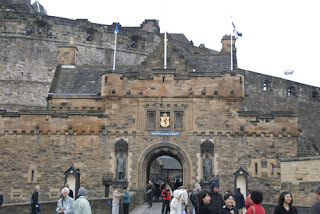 These Travelers recommend to any visiting the castle that they take advantage of the free tours given with admission. The tour guides are fantastic. The castle as seen from Princess Street. The main gate to the castle. The entry way is flanked by statues of William Wallace and Robert Bruce. 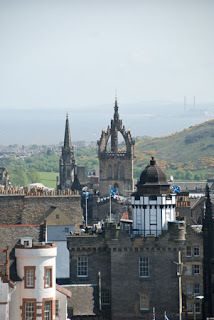 A view of the Old Town with Salisbury Crags and Arthur's Seat in the background. 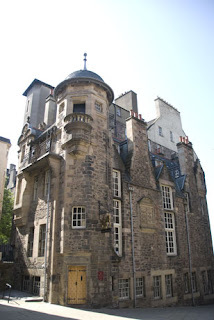 The oldest building in the castle complex, in fact the oldest building in Edinburgh, dates from the 11th century. This chapel is dedicated to St. Margaret. Margaret was the daughter of the English prince Edward the Exile, son of Edmund Ironside. She was probably born at Castle Réka, Mecseknádasd, in Hungary. Margaret was Queen consort to Malcolm III, King of Scots. Highlights of the castle include the Great Hall ceiling, a nice example of a painted wooden ceiling, and the intricate enamel and jewel work of the St. George and the Dragon pendant hanging on the Order of the Garter neck piece in the room with the Honors of Scotland, as well as the French Prisons, where there is an interesting display of the goods made in the prisons and the money counterfeiting paraphernalia used by the prisoners to obtain goods in town. 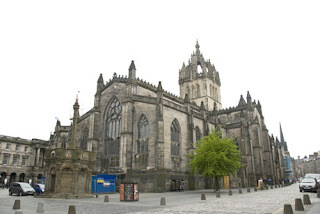 We then wandered into St. Giles Kirk. We were treated to a group rehearsing chorale music. 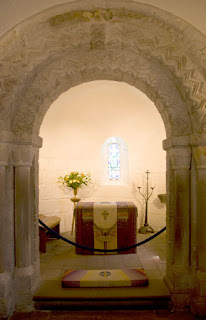 If you visit, please stop in and have a good sit beside the grave of Sir James Graham, the first Marquis of Montrose. Don't ask why, just do it. Appreciate the fact that the lines carved above his likeness were written by him shortly before he was hung, drawn, and quartered. 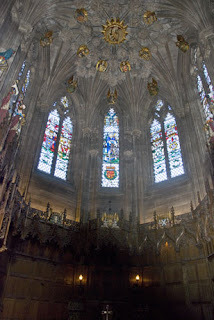 Then go into the Thistle Chapel. 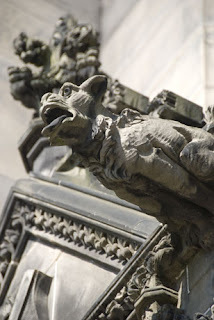 The Thistle Chapel is one of the best examples of wood carving one will ever see. 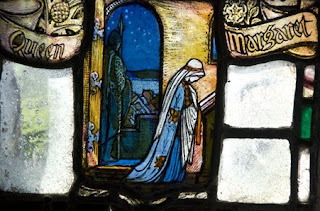 Thanks for the background about St Margaret of Scotland. Would you have any more information about devotion to her in Hungary? It's the first I have heard of that. Also do you recall the whereabouts of her chapel in Budapest, I assume? Have any photos of it?! There's an Anglican Church in Budapest called St. Margaret's which honors the Margaret who became Queen and Saint in Scotland. She should not be confused with the Hungarian St. Margaret who has an entire island in the middle of the Danube devoted to her. Margaret's Island sits in the river between Buda and Pest. Both Traveler Two and I would recommend a trip there. It is well worth it. Oh, thanks so very much. I loved Budapest when I traveled thru as a student, but have not been back since. Did you mean the Island is well worth the trip? I hadn't heard of the Hungarian St Margaret, I shall have to look her up! Do you recall much about the church of St Margaret of Scotland? Thanks for highlighting all this! 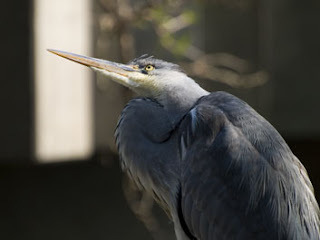 Yes, Margaret's Island in Budapest is worth a trip. It has the added bonus of having to take a trolley that lets you out in the middle of giant bridge over the Danube. (The station is IN the bridge).